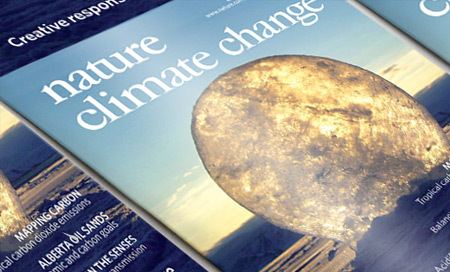 The feature article in the March issue of Nature Climate Change is written by Cape Farewell's David Buckland, and is titled Climate is Culture. A pioneering project that was set up to bridge a perceived communication gap between the science of climate change and the deep societal changes required to avoid dangerous impacts is explained by its creator in Nature Climate Change this week. In 2001, British artist David Buckland founded the Cape Farewell project, which he feels attempts to address one of the most pressing social issues of our time. This week’s State of the Arts (SOTA) conference hosted by Arts Council England in Salford had, for the first time, two sessions on ‘Artists and our future environment’, with speakers James Marriott from PLATFORM; the writer Jay Griffiths; Mojisola Adebayo, writer, performer, director; and Andy Field, co-director of Forest Fringe. All of SOTA’s sessions - on the creative economy, changing society, imagination, fundraising - touch on environmental themes. But these two drew out specific questions of the relations between artists and environments, of the material effects of artistic practices on the Earth, and of the importance of artistic expression of environmental themes. James Marriott's session, transcribed on the PLATFORM blog, sets out how this collaboration between disparate organisations has worked, and how substantial shifts in ACE's environmental directions are taking shape. A new play for children ages 8 and up runs at the Cottesloe Theatre 15-25 February. Island, by award-winning author Nicky Singer (Feather Boy), has been commissioned by the National Theatre's Learning programme. The play is set on the remote Arctic island of Herschel. In London, the Royal Court Theatre is looking for 100 word plays, on any subject, to be posted everywhere throughout the building, on the walls, in the lifts, under drinks, on the tickets. And the Tricycle Theatre is going nuclear with two plays about the atomic bomb. At ZSL London Zoo, ants perform in a robotic ballet. Across the country, Fevered Sleep is touring 'The Forest'. In Newcastle and Gateshead, the AV Festival will move as slowly as possible through March, with walks, exhibitions, symposia, film and music on themes of time and duration. The Sustainable Earth section at Fringe Arts Bath, and ‘The Home and The World’ event at Dartington are calling for projects and proposals. The Centre for Contemporary Art and the Natural World is auctioning works on ‘My Favourite Tree’. The Eden Project hosts a day of psychological and artistic investigation into the ‘Nature Crisis’. David Rothenberg launches his new book Survival of the Beautiful. Art, Science and Evolution. In a collaboration among LIFT, Artsadmin.and IMAGINE 2020, artist Michael Pinsky was commissioned to create a new work of public art in central London. Today the project is launched and will remain on view through 4 March. Blue circles of LED lights have been placed on the Seven Dials Sundial Pillar, the Duke of York Column, and the Paternoster Square Column indicating the height of the sea level one thousand years from now, if climate change continues unchecked. Though thousands of people pass these monuments every day, Pinsky's art allows people to see them in a new (blue) light. Together, the Plunge monuments create an arc across central London, following the line of a future Thames that has swallowed much of the capital in its wake.